How many time you come across websites which are in other languages which are not known to us. To read them we can convert them to English but we should first know which language is used on that particular page. After the language is identified we can easily convert them to English using any online language translator like Google translate. How to identify the language ? To easily identify languages used on web pages, here is an online tool from Google called as Google Language Detection tool. This tool comes very handy in many cases. Recently I’ve shared free kaspersky 2009 license keys. That website was in polish language. 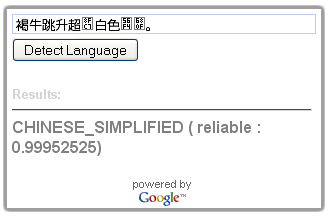 Using Google Language Detection tool I easily identified the language. You can also use it for such purposes. If I visit a site and it’s not English and there is no language translator plug-in installed and visible anywhere, then I would leave that site. I know it’s bad, but I can’t imagine trying to make out what they are trying to say. But thanks for mentioning the tool, it would come in handy now for me. Very useful tool. The best one for language translation. Auto detection feature really keeps you from frustration by doing the task itself. Just click and translate. Good one.